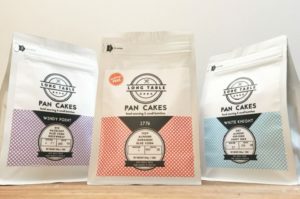 Long Table Pancakes is a small-batch pancake mix company in Chicago from Samuel Taylor and Susanna Taylor. They work with small farmers and millers to deliver the freshest possible grains grown on local Midwest farms. Their goal is to deliver to the consumer a tender cake that is also an unshakeable breakfast. The company is run from Chicago’s Lincoln Square neighborhood by Samuel and his mother Susanna. Samuel made whole grain pancakes five days a week for two years and took copious notes on the process and product in order to perfect the three flavors from Long Table Pancakes. Sample and shop with Long Table Pancakes at the Chicago Artisan Market on Sunday, March 10, 2019 at Morgan MFG, where they will be joined 100+ top artisans in food, fashion, home goods + art. Made with oat, almond, popcorn and poppy seeds. Delicate and airy, the popcorn – air popped and then stone-milled is what makes these the fluffiest and tastiest pancakes you’ve ever eaten. Popcorn flour – an invention of Long Table Pancakes. Made with rye, hazelnut, blue corn and buckwheat. Tender and substantial, these cakes have an earthy, complex flavor. Maple syrup never had so good a partner. Eat cake for breakfast work like a lumberjack. Made with teff, almond, sorghum and blue corn. Classic and satisfying and made to remind you of the best nomnoms of childhood. Every batch is tested down to 10ppm gluten, so it’s Celiac friendly. In addition to developing the recipes and establishing Long Table Pancakes, Samuel Taylor is a founding partner in the Back Room Shakespeare Project and author of the book My Life With the Shakespeare Cult. His mom Susanna is a retired movement teacher and therapist. She also runs Living Threads, an altar linen company giving fair-wage jobs to impoverished women in rural Haiti.